As of July 2008, we can have finally the first betas of what most of KDE users were waiting for: the betas of KDE 4.1 series. I've been using KDE 4.0 series since it was in early stages, and I've been keeping track of all SVN changes by rebuilding it at least two times per week, and trying to report as much bugs as I could. I must admit that it was (and *is*) a really exciting thing to have svn installed, as they burn it with changes at least every two days. But the wait isn't over yet, there is MUCH TO DO to improve speed of KDE 4.1,as it became already incredibly stable in these days. But... What about speed? The bad news about KDE 4 world nowadays is speed issues, it is true that a few seconds (two or three) passes since you click and the action is taken, and I could not tell what is the cause (KDE4 codebase, QT4 code, so much bufferings of transparency of plasmoids....) but I really know they CAN make it although maybe not for 4.1.x. 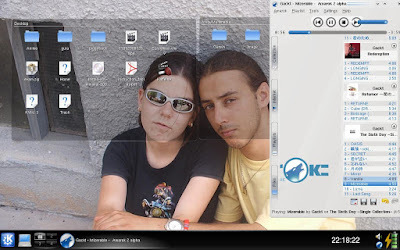 But leaving apart speed issues, I think KDE4 is definitely revolutionary, as you can see in several images all over the internet (including these two I published). Everything has evolved relatively quickly: almost every important program is ported to QT4/KDE4, or is being ported. The result is a whole new Desktop experience one can feel from login to logout. But not all in KDE 4.1 are plasmoids, it comes with a huge suite of programs (as it always had, some of them are redesigned, and some other are new) ported to new codebase, which makes it more usable. 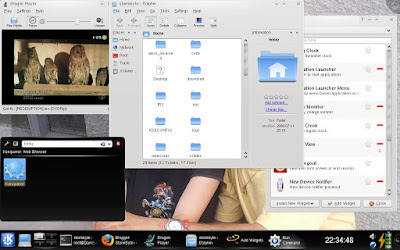 To comment only a few of them which can be seen in image 2: The Dragon Player, an excellent written from scratch video player; Dolphin, the new file manager, which counts with more features that konqueror had, like split view; the new Krunner interface (triggered by default with ALT+F2) to execute commands, and even more. On the other side, just to mention why KDE 4.1 will be good for integrating programs are SOLID and PHONON which still need to be improved, but could show nowadays the power of the near future of KDE: While solid abstract programmers from all hardware access they could need (without bothering programmers to write code for hardware access), phonon does the same with audio related issues, and thus, allow programmers to spend their time in what is really important: their programs. To sum up, I am just adventurer to install from SVN, but I invite anyone to go and try the beta, and of course, to install 4.1.0 when it's ready (near July 22th). Other drivers do not have this issue. It's not normal to have to wait seconds until something happens. I can reproduce it here on one machine, btw.